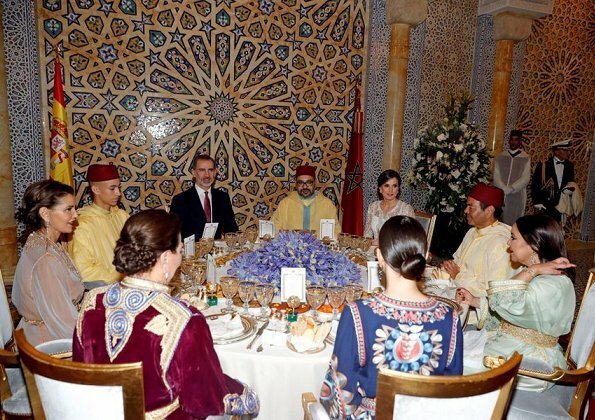 In the evening of February 13, King Felipe VI of Spain and Queen Letizia of Spain attended an Official Dinner held by King Mohammed VI of Morocco at the Royal Palace in Rabat, Morocco. 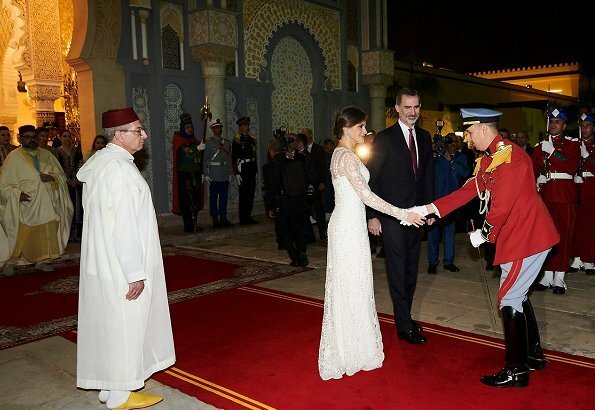 King Felipe of Spain and Queen Letizia of Spain are currently making a two day official visit to the Kingdom of Morocco on February 13-14, 2019 upon the invitation of King Mohammed VI of Morocco. Oh, yes! Totally gorgeous. Hair, make up and stunning dress. Back on form with a vengeance. Go, Leti! Fantastic dress and Lady. All the Ladies look very good. Sadly Pss Lalla Salma was missing. Oh, my, what to say about such a beautiful gown and embroidered lace coat? One would hope for several occasions to be able to wear it. It is a true piece of art. How does it feel to sit on all of those beads and pearls, I wonder? Stunning!!! Her taste has never been disappointed me! This lady can glam it up! Her most flawless makeup to date. The delicate embroidery of the tunic, which seems to be a nod to the host country. Perfect! Is that Lalla Salma in the black dress? More pics at "ParisMatch"... The Queen looks wonderful. I miss the sight of the beautiful Lalla Salma. Hope she is doing fine. Are there not rumors that something is wrong between Lalla Salma and her husband? I read in a magazine about royals that she hasn't been attending formal events for months. It seems like nobody really knows the truth, but I for one do belief something is wrong. She is not ill or whatever. 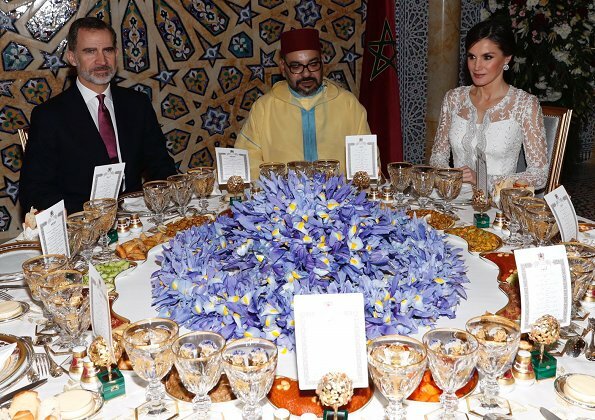 Exquisite dress for Letizia. What a stunningly beautiful woman. However , where is King Mojammed's wife? She is an equally stunning woman. This is a real treat! All woman are wearing equisite outfits, I can't decide which one is my favorite, each of them is packed with art and historic value. Great! Is that true? What a shame! Such a gorgeous woman! What else is there to say but WOW! She is really is the best at paying homage to her host country through fashion. vERBLUFFEND MOOI. Maar waar is LALLA SALMA, in een vergeetput? weet iemand iets over haar? King Mohammed's sisters don't look classy at all. I miss Lalla Salma's poise and elegance. Her son favors her looks. I love Queen Letizia but I don't like her dress. 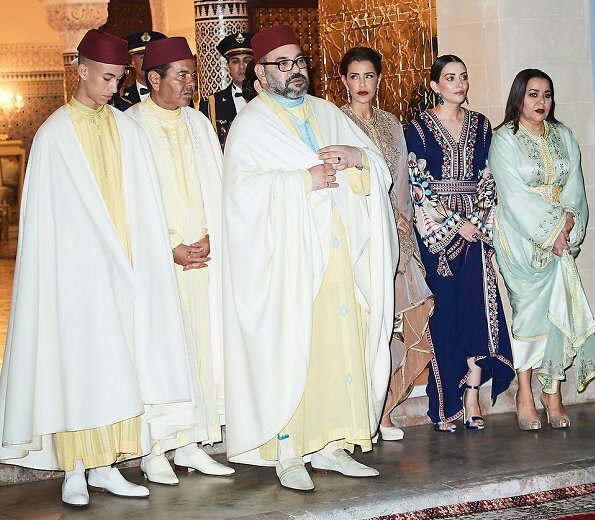 It looks like she wanted to acknowlegde the moroccan caftan but this is a rare miss for me. Wow wow wow. She is outstanding here, smashing. Everything is beautiful here, especially the gown, but also hair and make-up. 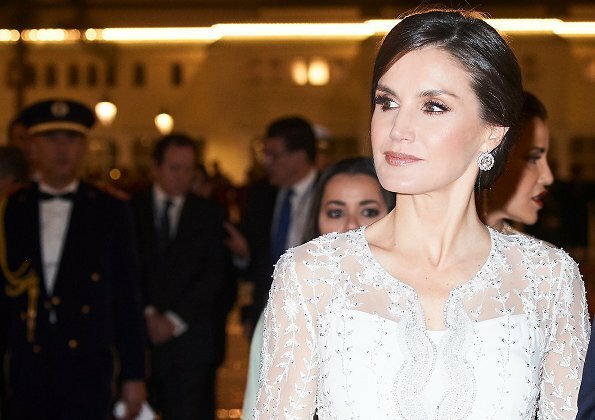 Another striking look for Letizia! With the embroidered lace coat she also gives a hint to the style and fashion of the country she visits. The lace pattern is something you often see in dresses and skirts of Morocco. Don't forget those smashing earrings. I'm not a fan of white dresses but this one looks very nice and perfect on her, than the makeup, hair and all complements create an amazing look. Varela is often accused of adding one or two details to his design, but when he showcases his most famous client it is classic! He fits her proportions perfectly. His embroidery is intricate. Applause for you sir! Wow to the total look. In Morocco brides do not wear white, if not bright colours, she is there. Q Letizia looks stunning, so the other Royal Ladies. Queen Letizia looks absolutely STUNNING.From the tip of her head all the way down to her shoes. Una escenario muy hermoso. 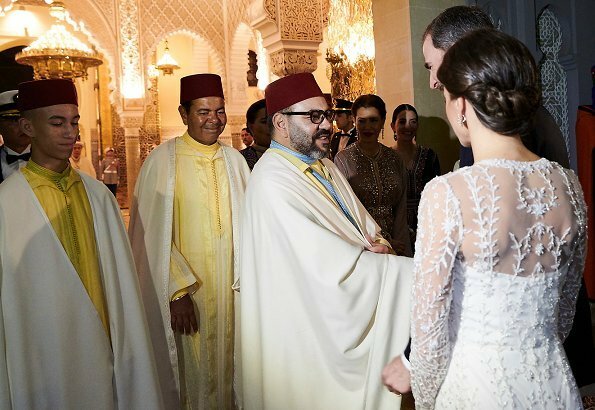 Las damas marroquíes ponen en magnífico colorido de sus kaftanes y la Reina Letizia la delicadeza del vestido blanco, su precioso moño y los pendientes de ensueño. Bellísima y luminosa. 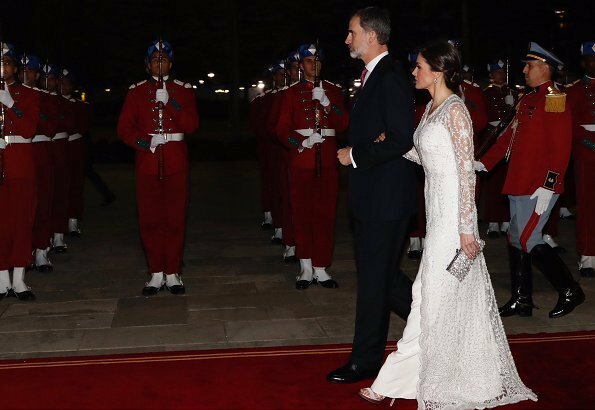 In my opinion this is the most beautiful dress Letizia has ever worn !!!!! She is gorgeous ! !